DETROIT — Ford Motor Co.'s CEO downplayed a report that the automaker may cut 25,000 jobs and said he'll have more news to share later this week. 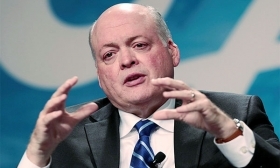 CEO Jim Hackett told reporters Tuesday that Ford didn't provide numbers to Morgan Stanley analyst Adam Jonas, who estimated the significant employee reduction in a report a day earlier. Ford said in July it would spend three to five years on an US$11 billion restructuring. Ford will make an interim announcement about plans for its workforce later this week, Hackett told reporters in Michigan. General Motors announced last week it will cut more than 14,000 employees and close seven factories worldwide by the end of next year.